Gina here with a quick and easy project for steampunk lovers. To create this little box I began with the ATC Shrine Box. 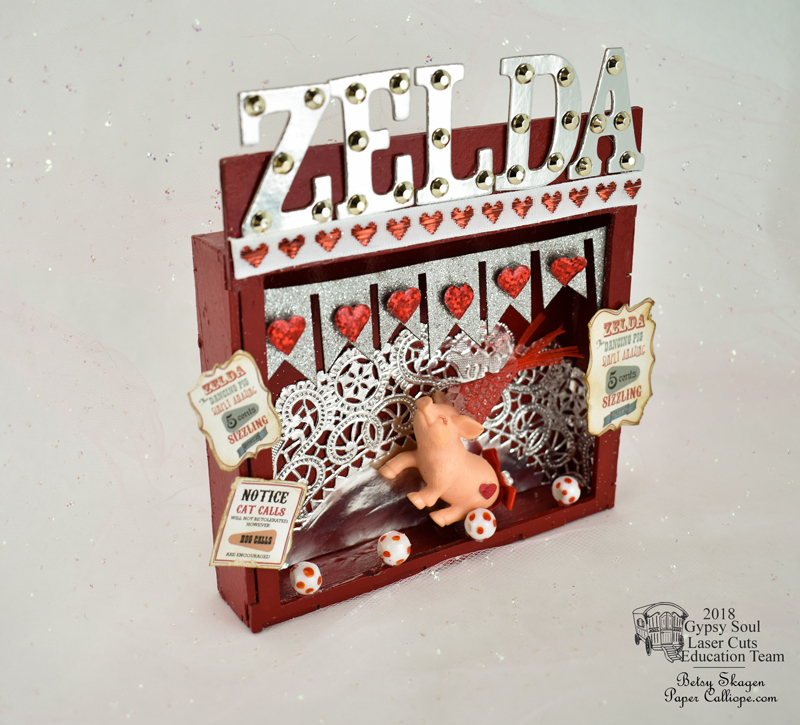 I glued the box together and gave it a coat of acrylic paint in metallic gold as a base color. Using several colors of distress stain I created a rusty texture on the outside of my box. 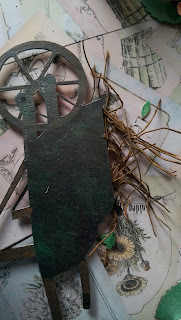 I used the same technique to create some rusty pieces I selected from the Steampunk Shape Set. I cut a piece of paper from the Bo Bunny Penny emporium Collection for the background of my box. 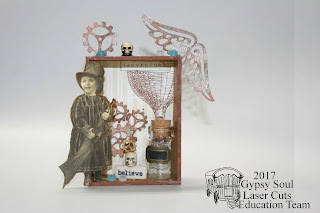 I added some beads and trinkets from my stash along with a little steampunk girl I found online, printed and fussy cut. 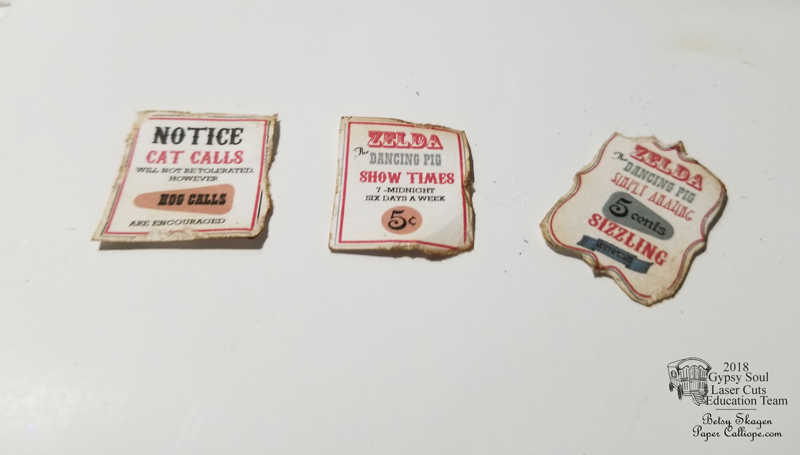 I rearranged the pieces until I liked the layout and glued everything down using Quick Grip glue. 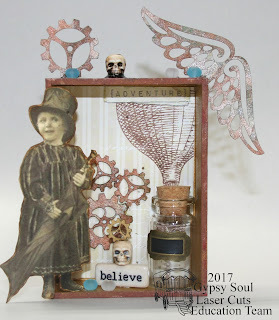 Labels: ATC Shrine Box, Steampunk shape set. 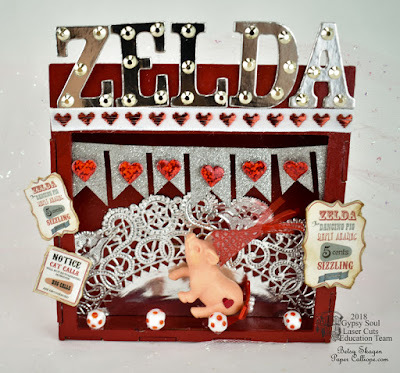 Hi every one, Heather here again today finishing the post that I started on Dec. 31st. 2017 It is strange how when you begin something you have an idea in your head as to what it will be, but when you leave it and go back to finish it, sometimes you change your mind and decide on a different end product. 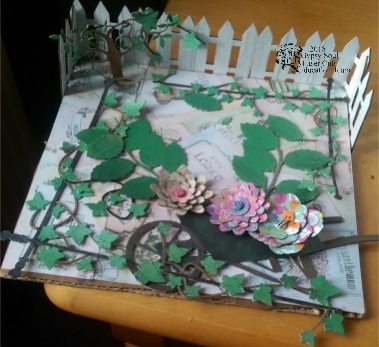 I decided to try and make my project look something like the garden that I would like to have, not the one I was trying to make look good. 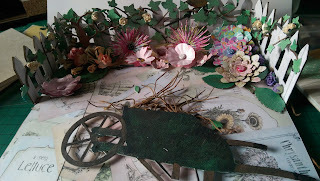 The wheelbarrow I coloured with Creative Expressions gilding polish then used the "stems" of my small flowers and bulbs as twigs coming out of the top of the wheelbarrow. Every garden needs a wheelbarrow doesn't it? 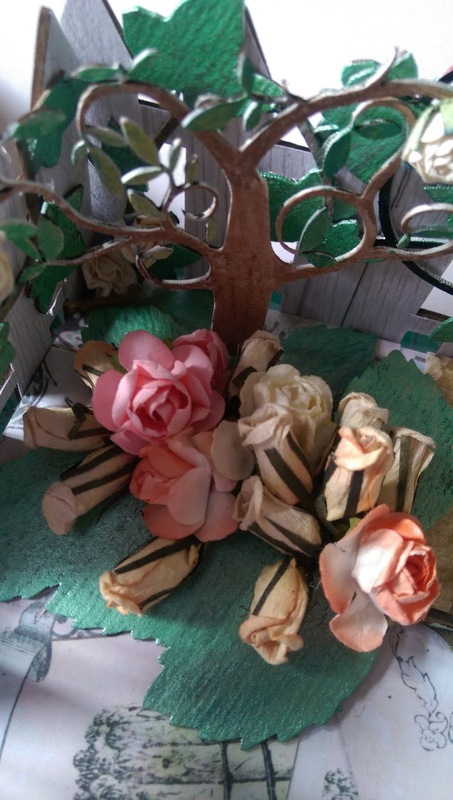 I made up a small arrangement of flowers and buds that I already had and put those at the bottom of the tree which I had placed in the corner of my garden. 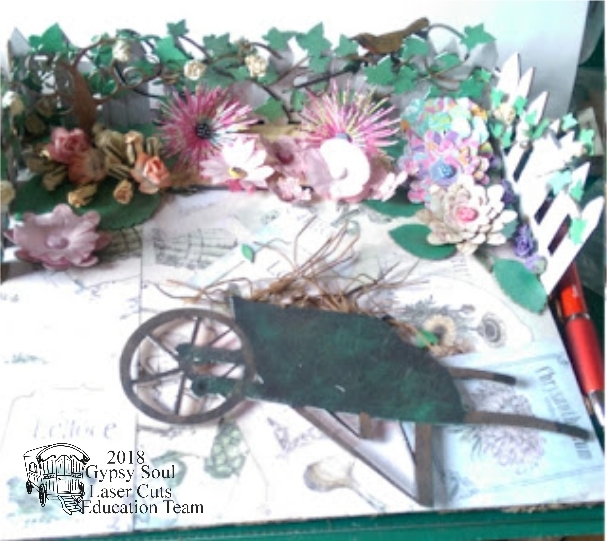 The gslcuts flowers went to make another flower border. 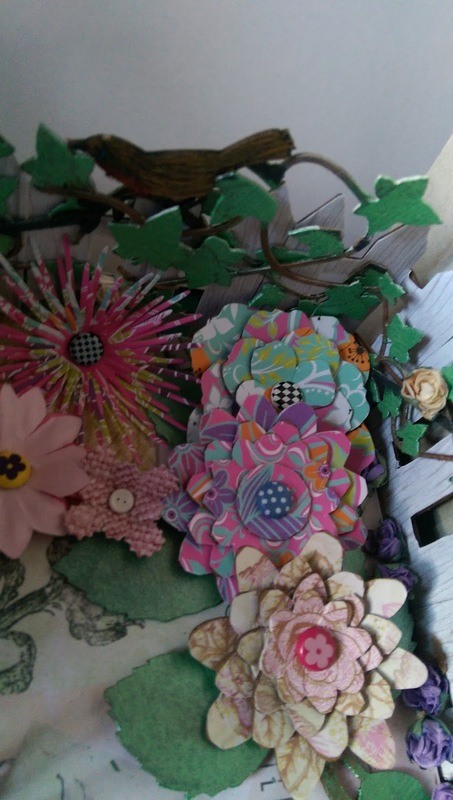 Then I made up some flowers using dies to cut them and putting these along the top to make the last flower border finished my garden. I nearly forgot the gslcuts bird which I sat on the fence amongst the ivy. This is a very easy project to make so I hope you will have a go and do your own garden, and don't forget just because something is sold, maybe as a corner, it doesn;t have to be used for that purpose, e.g. 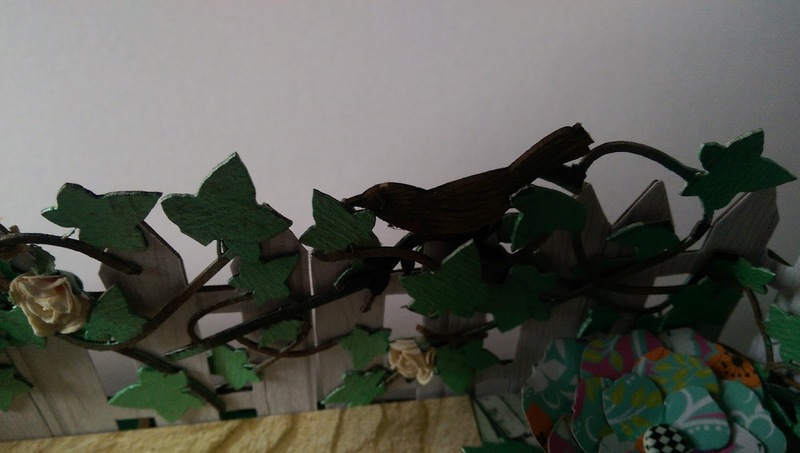 the Ivy corner I cut up and decorated the fence with, and the little bird was part of a frame but I cut it off and sat it on the fence. For all my love of horror films, foul language, and filthy sense of humour, at my very centre is a squishy old timey romantic core. I had it in my mind that to create a kissing booth. Something fun and flirty. Instead this terribly lovey dovey vintagesque smoochy kissy thing appeared. I've used a Square Shrine Shadowbox as the base, and added other elements to fancy it up. 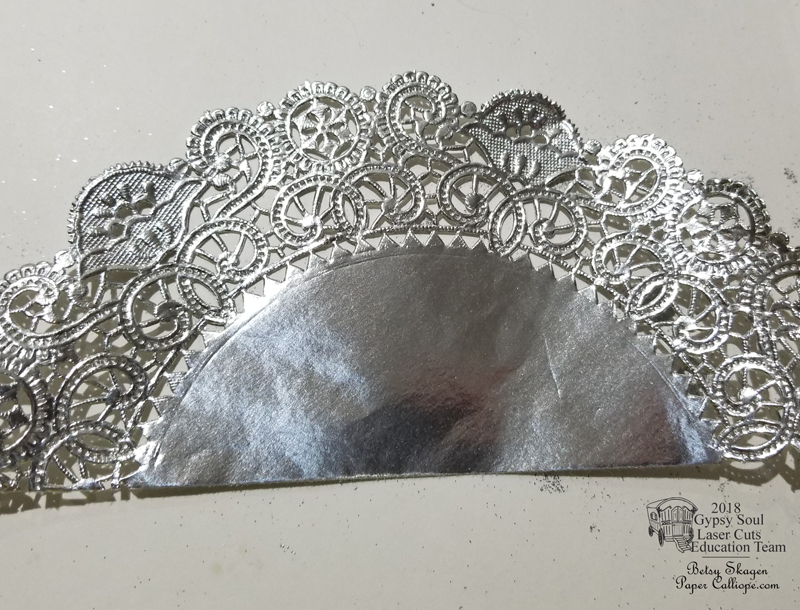 I've taken the largest piece from the Flourish Medallion Set, chopped into quarters and set in each corner. 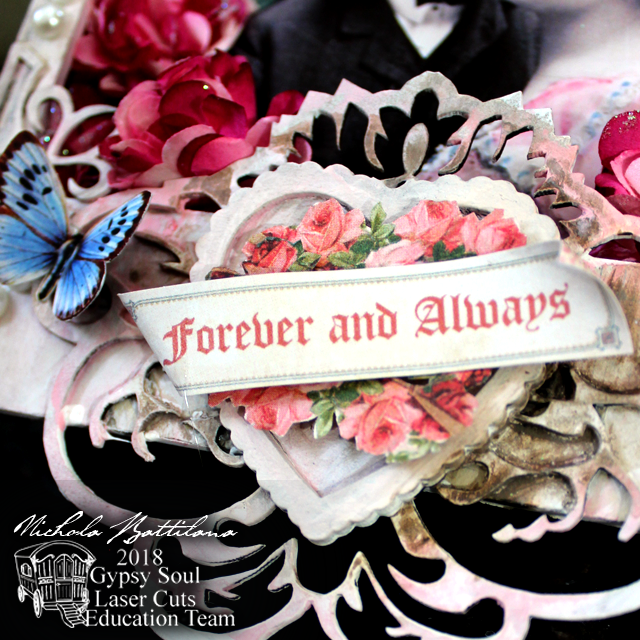 Damask Singles decorate the inside background and the frontpiece. 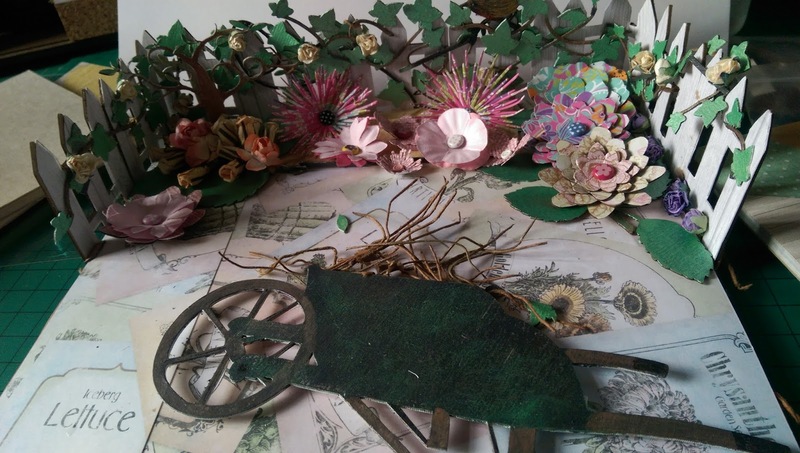 Although you can't see them here, the hanging ribbon is attached to the piece by looping through two Clock Hands. 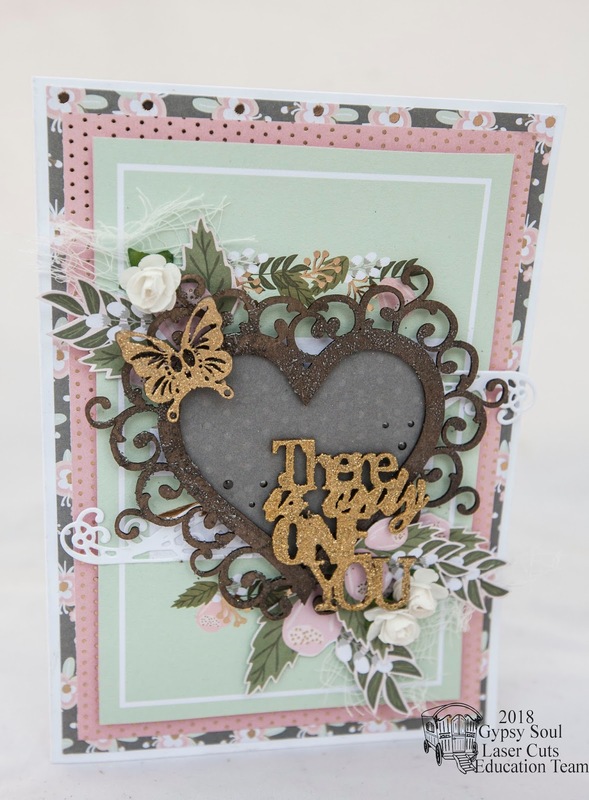 A heart shaped cutout is layered with fussy cut flowers and and a sentiment from Graphic 45's Sweet Sentiments collection. 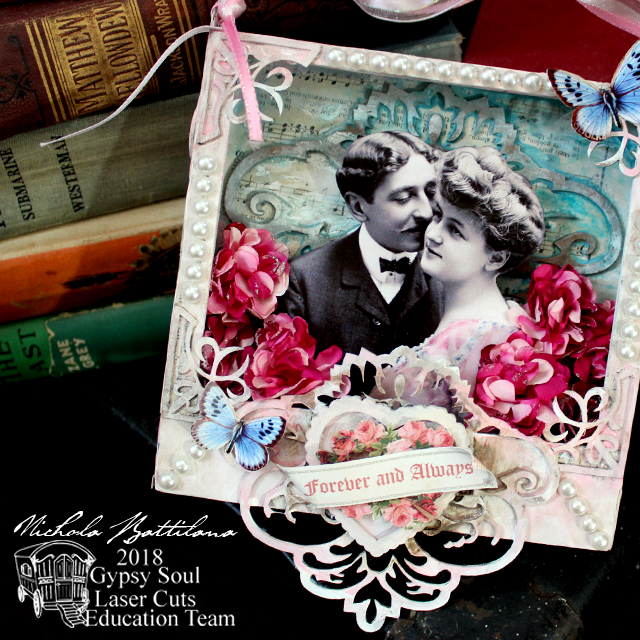 The glorious vintage I used is free and available from thegraphicsfairy.com BUT If you have a smoochy someone, perhaps you could use something a little more personal. And here's a list of all the bits you'll need to make your own vintage smoochy lovely shadow box. Hi it's Teresa here on this gorgeous Sunday and I have a fun and simple Valentines make with you today. 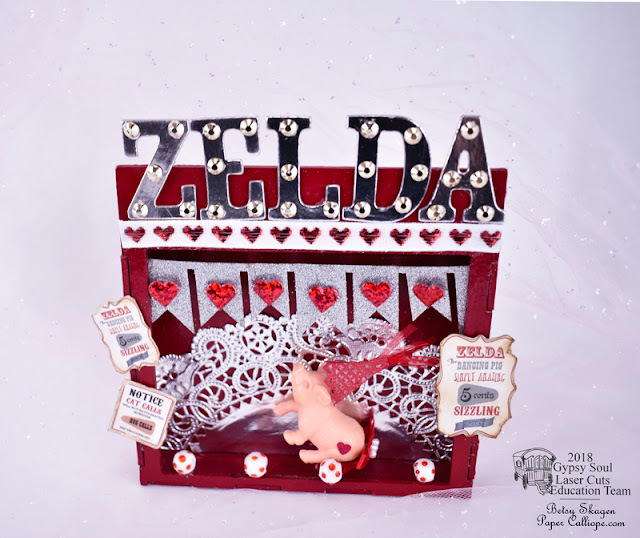 I used the "Hearts Wallhanging Chipboard set" but I used it a different way instead of hanging all the hearts seperate I just overlapped each of the pieces on top of each other. 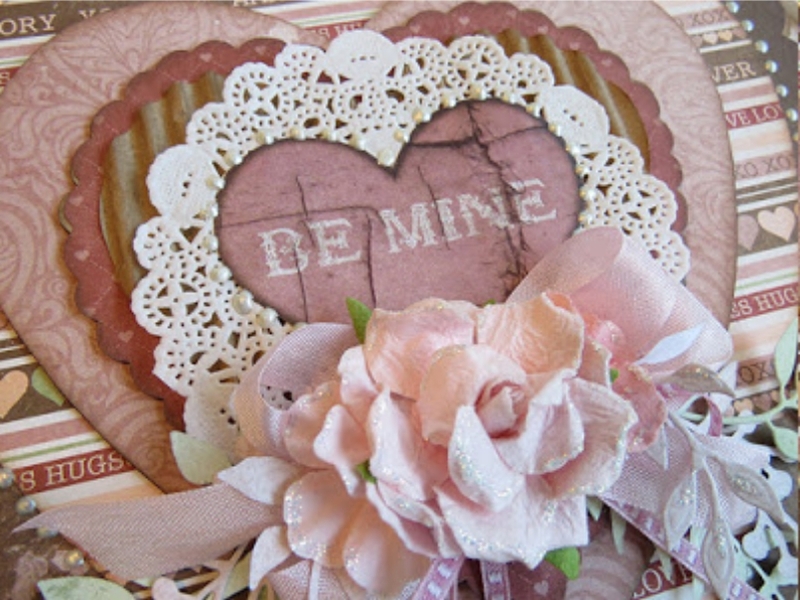 Now you can hang it up anywhere in your house to decorate and then you have a second one to make to give to a friend. 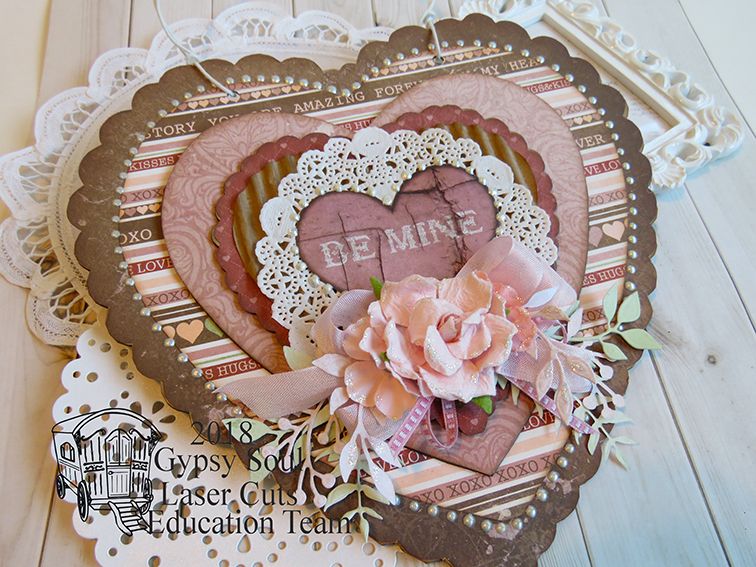 So to make it I started with some cute Valentine papers that I had and traced around all the edges of the chipboard pieces and then hand cut them to fit. 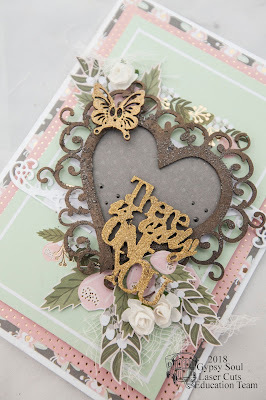 You can use a nail file to soften the edges and then chalk around them to add more dimension. 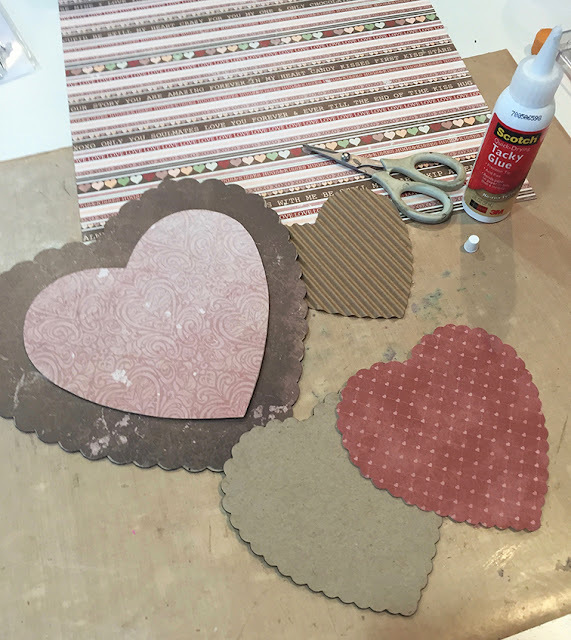 For the striped paper I traced around the larger pink heart and then added an extra inch or so and then cut that out so that it added colors to shadow the pink heart. 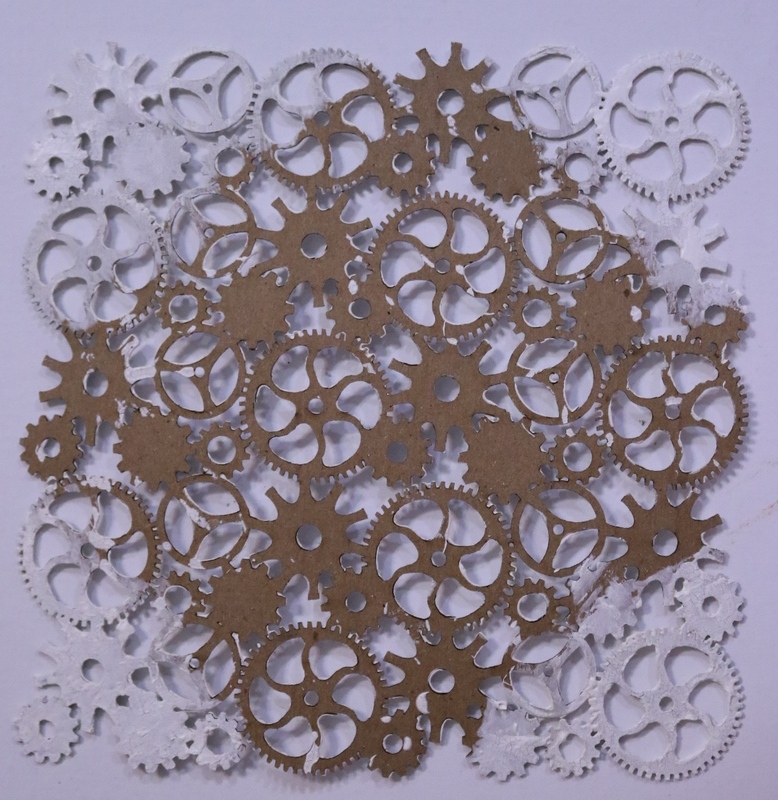 The doily was just one I had from my stash. After all the pieces are dry you can glue them all together and put a book on them to keep it flat. 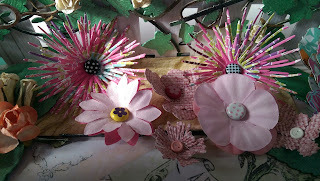 Then I added some liquid pearls around the edges and pretty flowers and ribbons to hang from the center. For the wire that hangs I just punched 2 holes with a crop-a-dile and twisted white wire from the floral section of your local craft store. 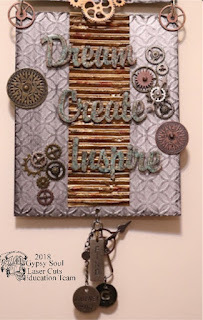 This is a great project to use for left overs and you could easily use it to hang on your door this year!! Hope you like it. Have an amazing day!! 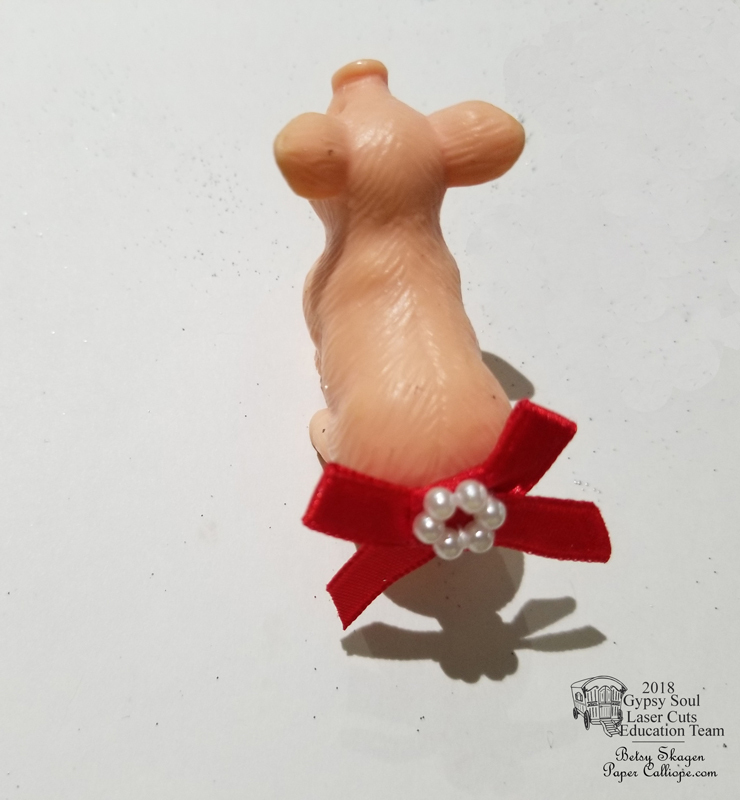 Glue a bow onto the tail of a toy plastic pig and a miniature foil heart onto the pig's leg. Isn't she cute! 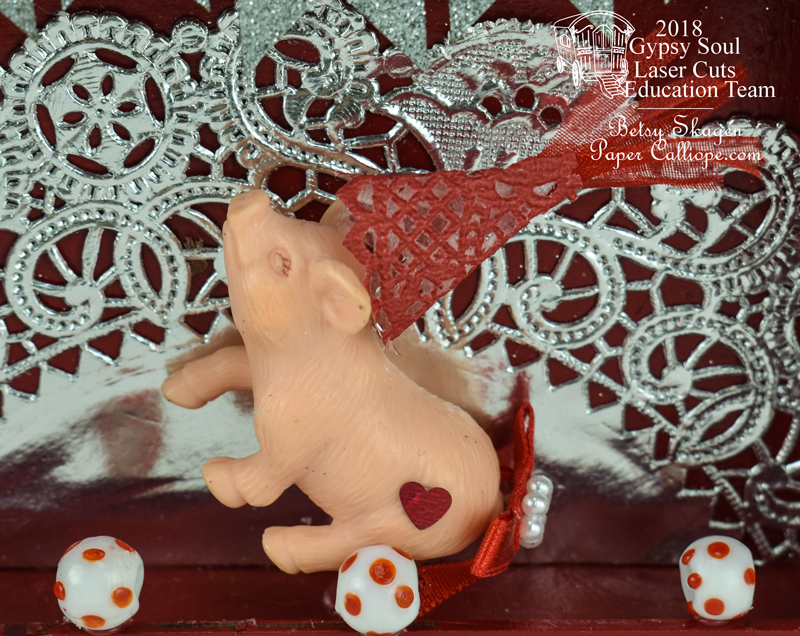 Make a hat for the pig from a red doily and sheer red ribbon. Glue the pig onto the stage. 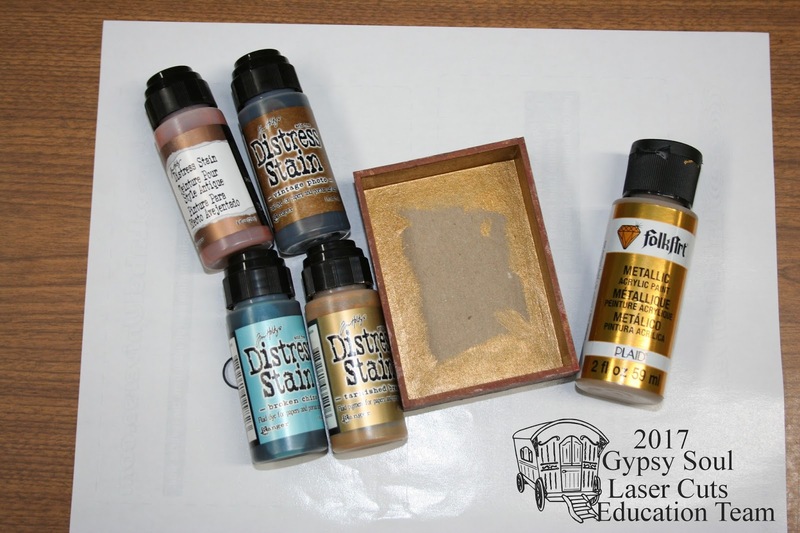 Next ink the posters with brown ink and trim them with scissors. 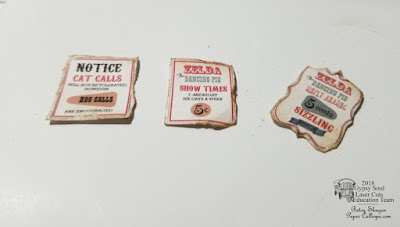 By tearing them first you will give the posters a worn and distressed look. Glue the posters to the side of the stage and your stage is complete. Every now and then, a card design really comes together. 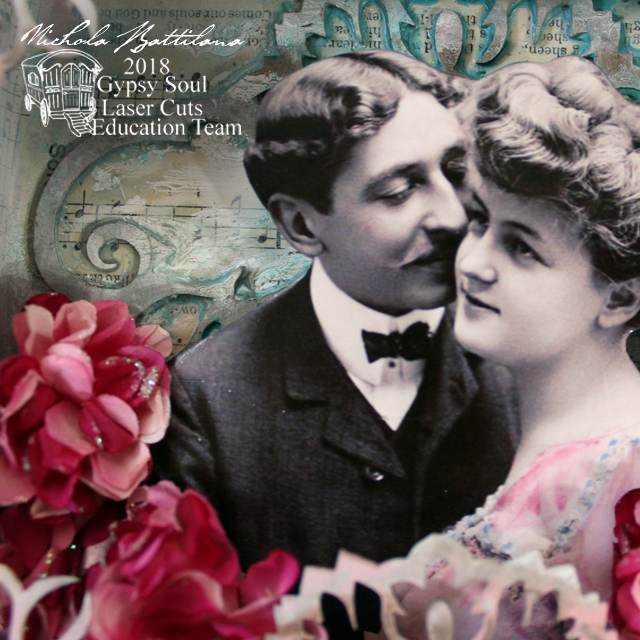 I really loved this first one that I made, so what I like to do is immediately repeat the design on a second card, but I like to substitute some of the main elements. What I ended up with is two cards that I love, that look quite different, but are actual the same design. The best part was the second one came together really quickly. 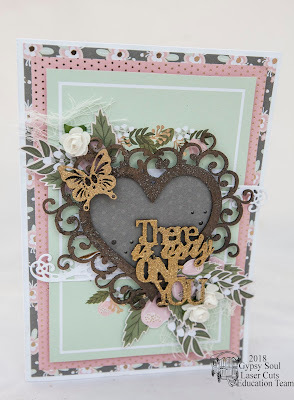 I started out with a 5x7 card base, and layered two co-ordinating patterned papers leaving a small border between them. 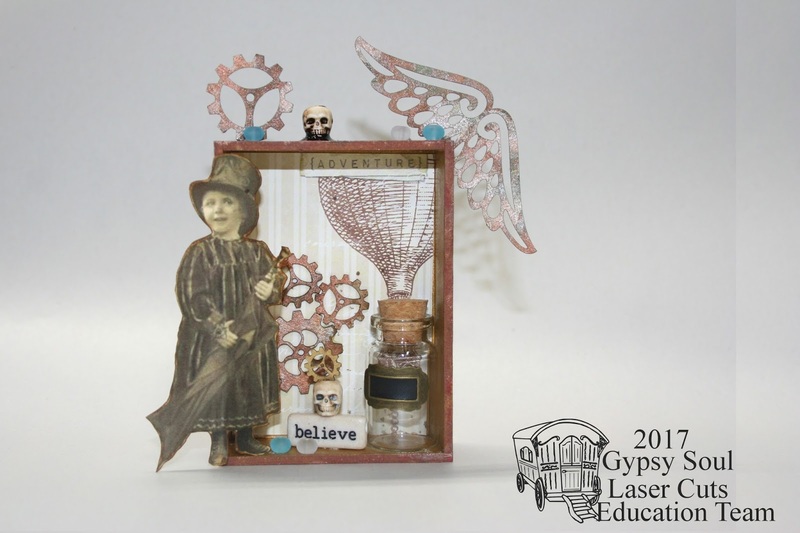 The third layer is a journaling card from the same collection. 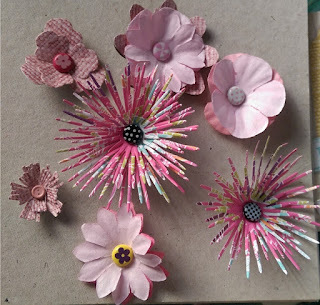 I used foam dots on this layer to add dimension. Both of my frames from the Filigree frames Shape Set were inked with grey ink, then randomly coated in metallic embossing powder. 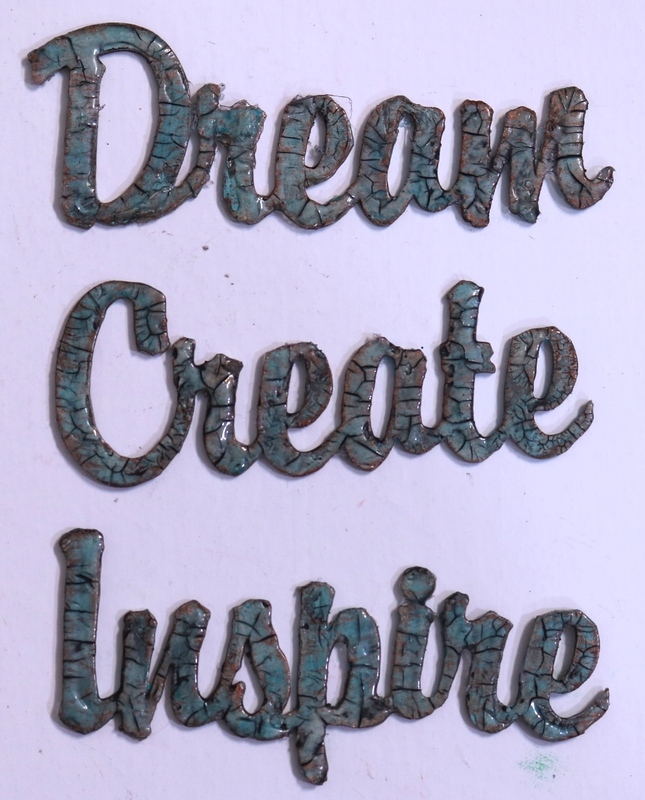 Some of it blew away as I heated (must need new glue), but I actually love the speckled effect that resulted from it. I backed each of the frames in a plain coloured paper to help ground them and create a base for the title. 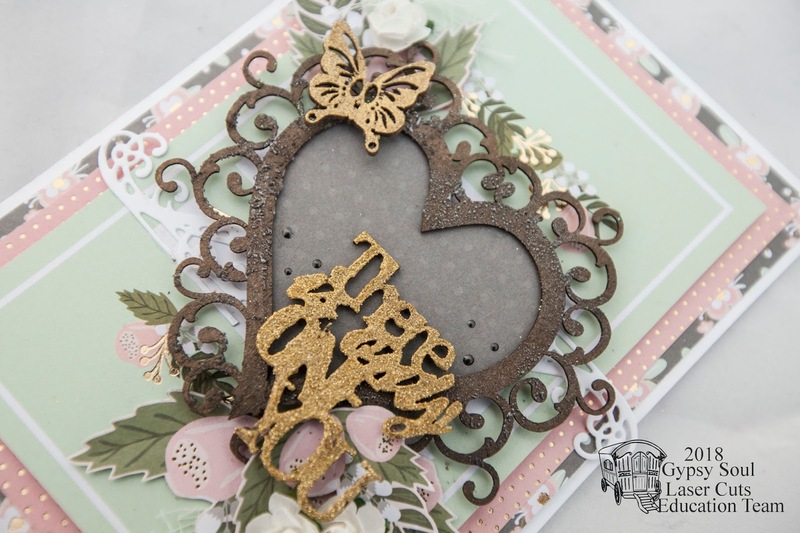 The titles, butterflies and dragonflies have a coat of gold glitter embossing powder. These turned out even better than I imagined. 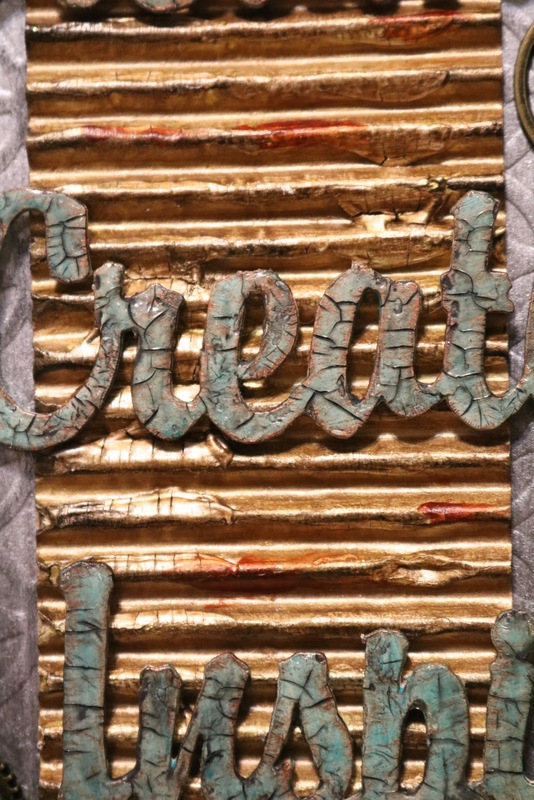 I originally wanted a matt gold to mimick the gold foil in the paper, but this is what I have, and I love it. It has a really cool texture too. The final additions were fussy cut flowers, paper roses and some gauze, along with some tiny drops of dimensional paint. Hi everyone! I hope that wherever you live, you all are keeping warm! We've certainly been having some crazy weather lately. 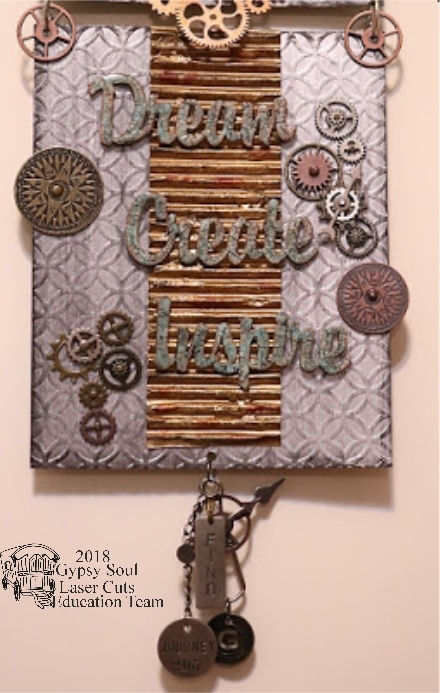 But, when it is freezing cold outside, I can't think of a better thing to do than hunker down in my craft room and get busy with some craftin'! I love this Flying Heart Wall Hanging, along with the Gears Texture Sheet 6x6, from Gypsy Soul, and I've been holding off using it until I had a good idea for decorating it. Scroll to bottom to see close-ups. 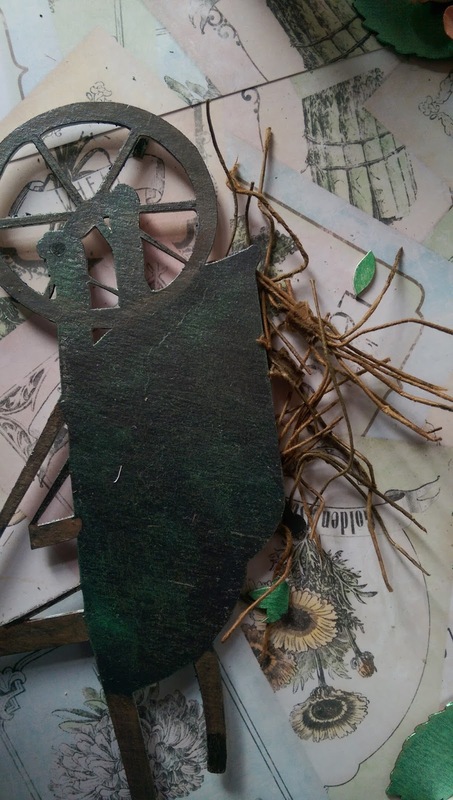 I always lay my pieces out to see how they look, and move them around if I need to. This is the arrangement I think I will be sticking with but, of course, that could change. I never really know. 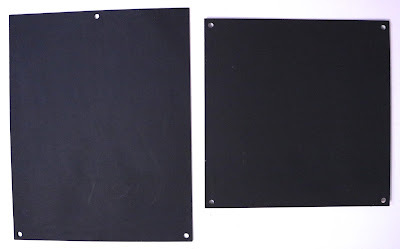 Step 1: Paint both sides of the chipboard backing pieces with black acrylic paint. Let paint dry. 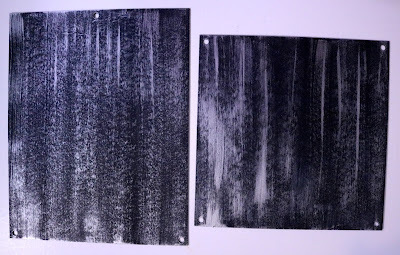 Step 2: Dry brush a coat of silver metallic paint over the surface, leaving some of the black paint showing. Let paint dry. Step 3: Brush a wash of silver metallic paint plus water over the surface again, leaving a smaller amount of the black paint showing. Let dry. 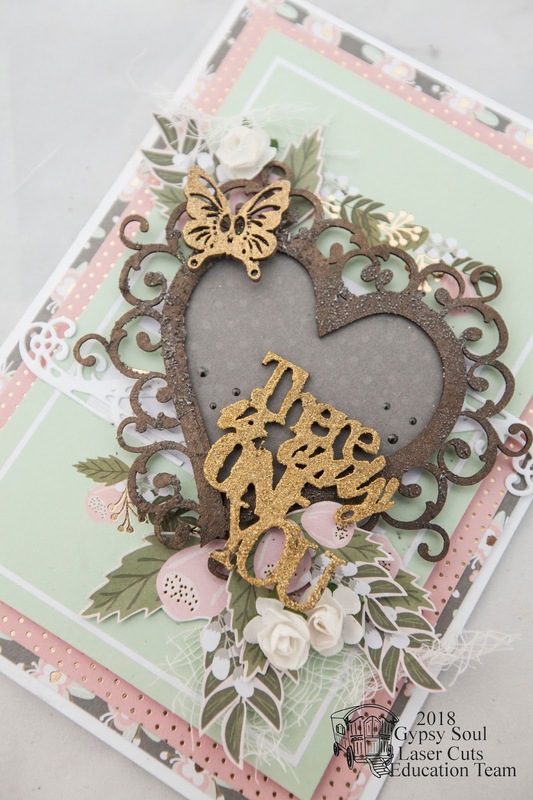 Step 4: Run chipboard pieces through die cutting/embossing machine with embossing folder. Step 5: Lightly sand the embossed areas to enhance the design. Use a damp baby wipe to pick up a small amount of black paint and edge the pieces, as shown. Brush crackle paste over the Gears Texture Sheet 6x6 on one side and let air dry. Turn over and brush crackle paste on each corner, again let paste air dry. 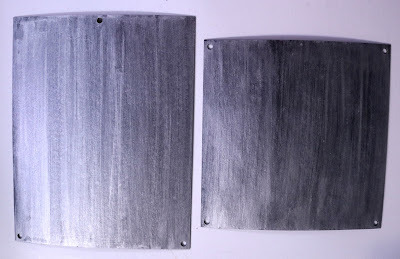 These corners will hang off of the background piece when attached diagonally. 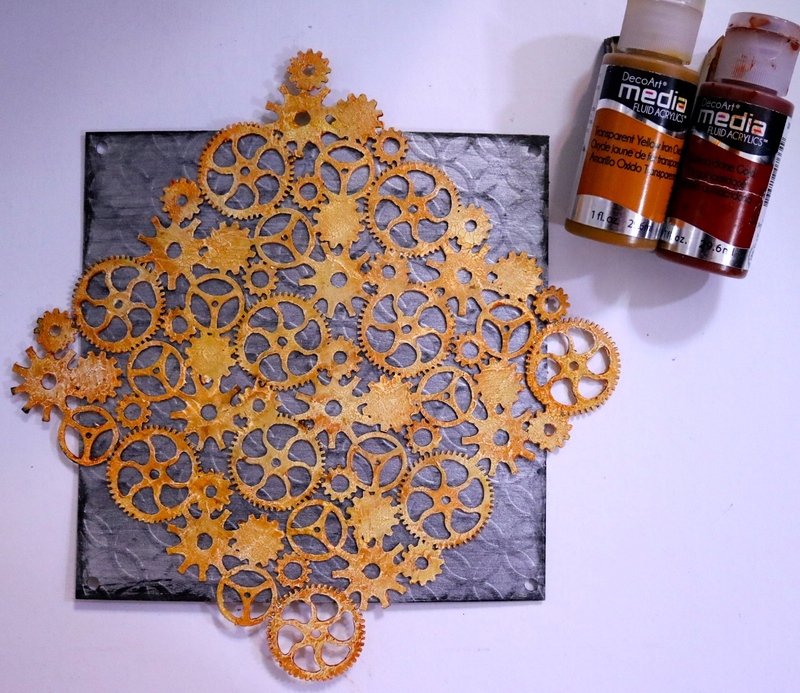 Brush coat of Yellow Oxide over gears sheet, then a coat of Quinacridone Gold. Use baby wipe to wipe away some of the excess gold, leaving a bit more of the yellow to show through. You will need to do this same process for the corners on the back of the sheet. 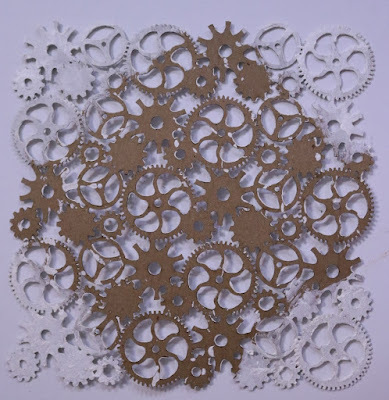 Glue gears sheet to square background chipboard piece, as shown. 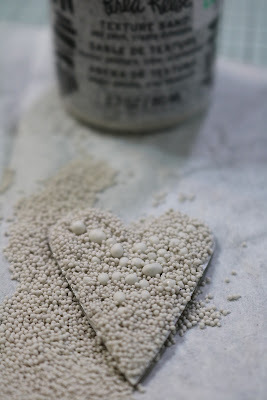 Add a thick layer of crackle paste to the heart and allow it to air dry. Paint heart with Transparent Red Iron Oxide and let dry. 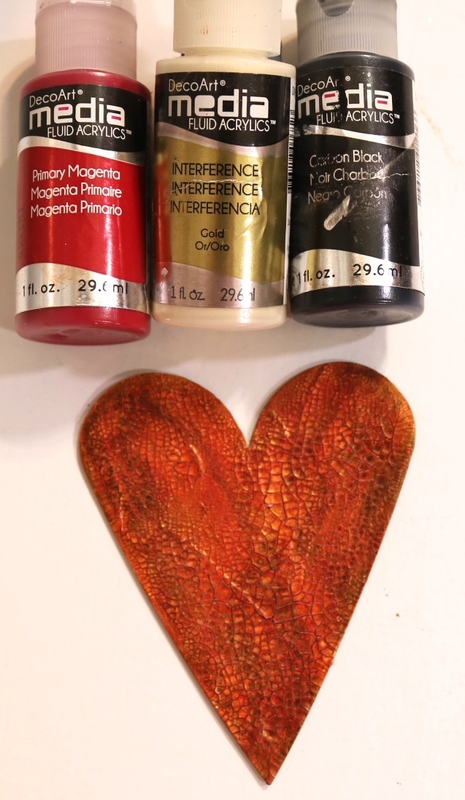 Add a light coat of Interference Gold over heart and let dry. Use a baby wipe to pick up a small amount of carbon black acrylic paint and wipe over surface of heart, letting the color go into the cracks. Wipe away excess before it dries. Add a tiny amount of Primary Magenta over the surface and let dry. 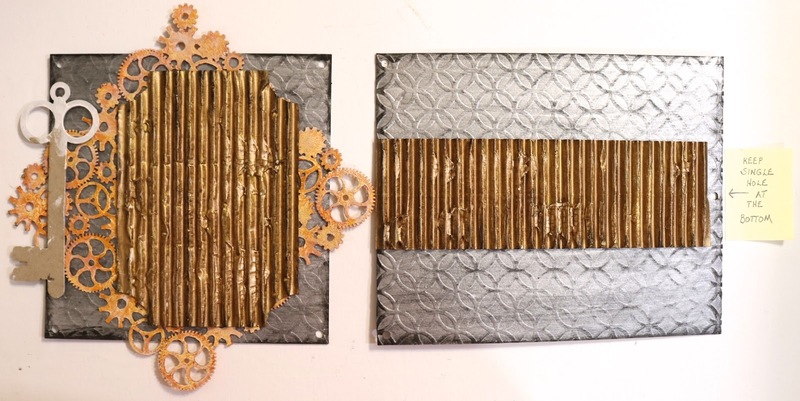 Then add one more light coat of Interference Gold to bring back the shine. Paint wings with silver metallic paint, then with 1-2 coats of Titan Buff. Sand some of the buff color off of the wings to reveal some of the silver. Add a wash of Cobalt Teal Hue with water to add the blue tint. 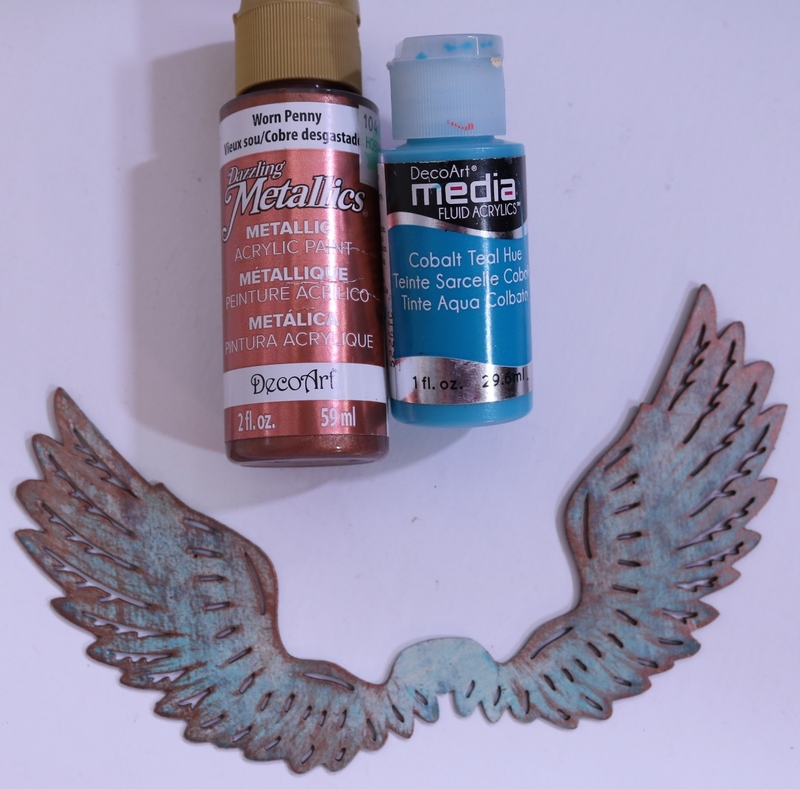 Next, dry brush Worn Penny paint over the wings with a stiff brush. Apply a coat of clear crackle glaze over the wings and let air dry. 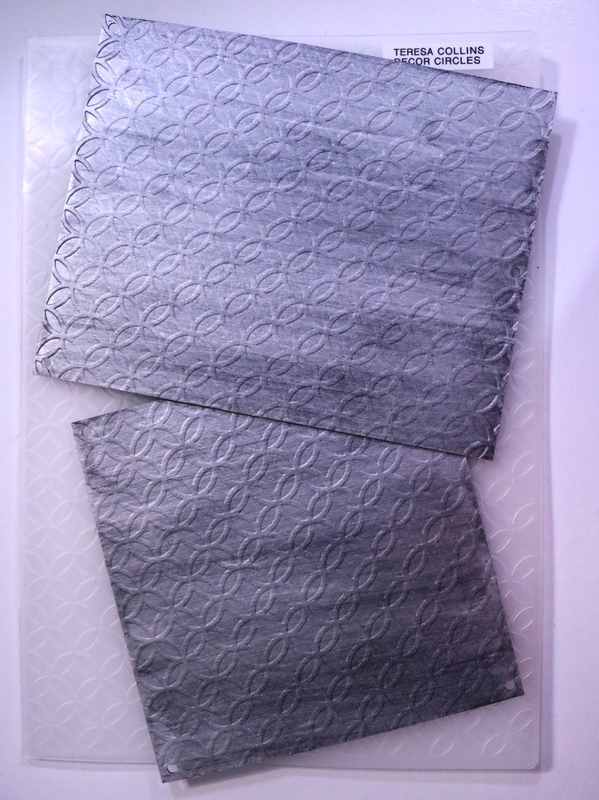 Use damp baby wipe to pick up Carbon Black antiquing cream and cover wings, let dry. 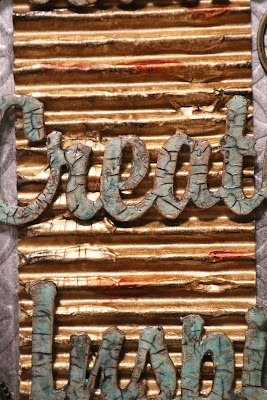 Wipe away excess antiquing cream, which will bring out the cracks made from the crackle glaze. Repeat the wings process for the words, as shown below. Paint corrugated chipboard pieces with a coat of white gesso first. 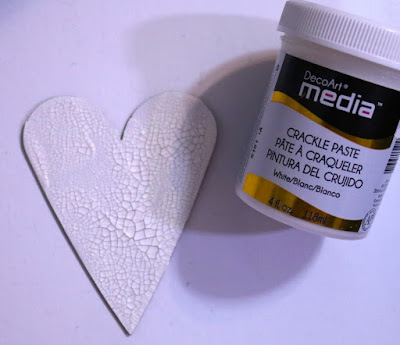 Spread patches of crackle paste over both pieces randomly, as shown, and let air dry. 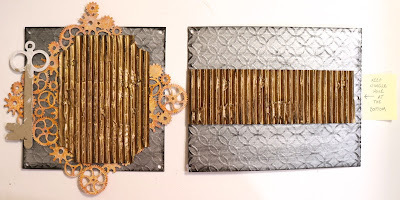 Paint both pieces with Bright Brass metallic paint, let dry. Then add a coat of Rich Espresso metallic paint. With a damp baby wipe, pick up a tiny amount of Carbon Black acrylic paint and hit the tops of the corrugations, as well as the edges. Glue both pieces to backgrounds, as shown. Remember to leave some space for the large key at the top of the square piece, and be sure not to cover up the single hole that is centered on one edge of the rectangular piece. This hole will be at the bottom of the wall hanging. 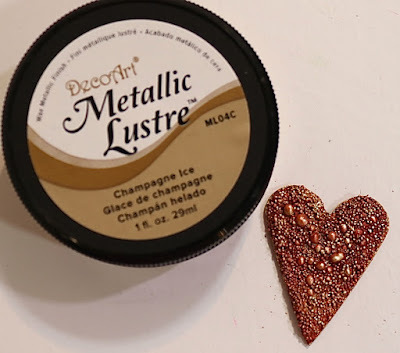 Cover heart shape with clear glue and pour texture pebbles and texture sand over it. Set aside to dry. 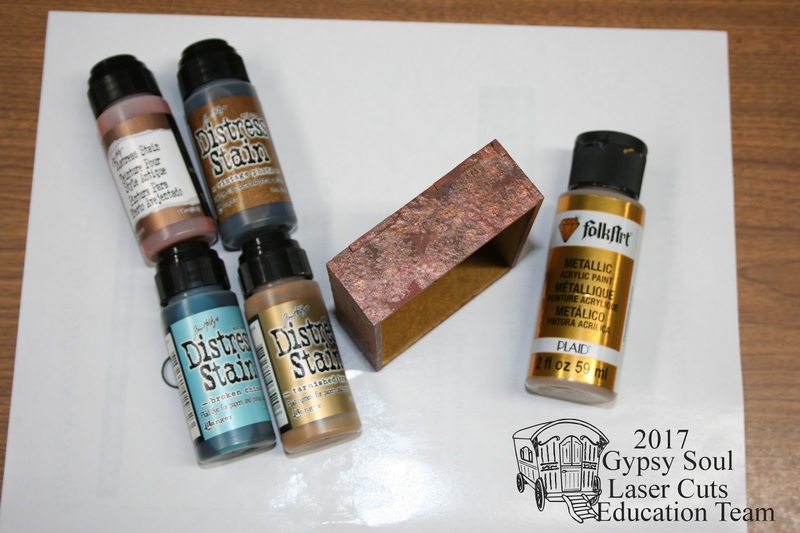 Paint with a wash of Transparent Red Iron Oxide and let dry. 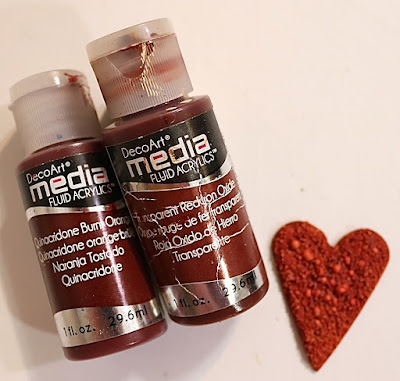 Then add a coat of Quinacridone Burnt Orange to give it a really deep color. Let dry. Pick up a small amount of the Champagne Ice metallic lustre and hit the high spots. Paint both keys with white gesso, let dry. 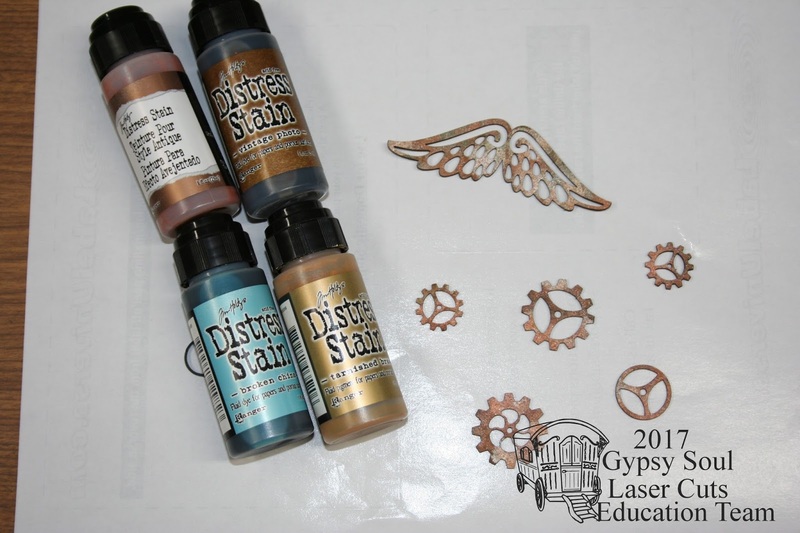 Then paint both with Worn Penny acrylic paint and let dry. 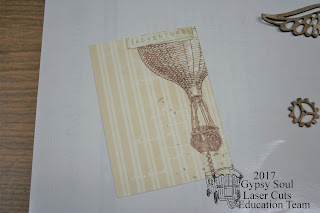 Emboss keys with Stripes embossing folder. 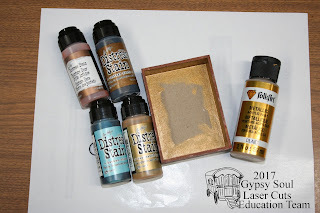 Pick up Burnished Brass Metallic Lustre with your finger and rub over high spots, then seal with Gloss varnish. For added depth and dimension, I added the carbon black antiquing cream over the keys to age it. (See photo of finished project). 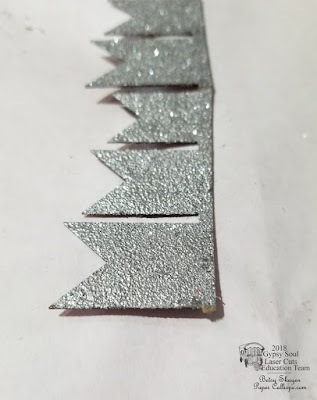 Paint crown with white gesso, then silver metallic paint, let dry. Use stiff brush to dry brush Rich Espresso over bottom section of crown, let dry. 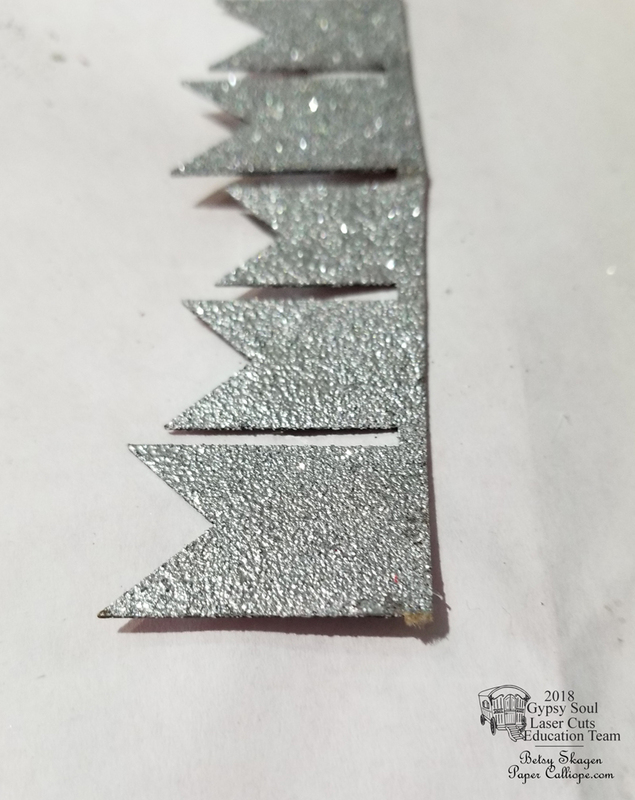 Glue diamond gems to the top of each point on crown. 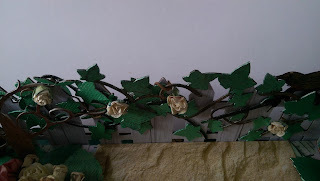 Finish gluing all the pieces to the base, as shown. 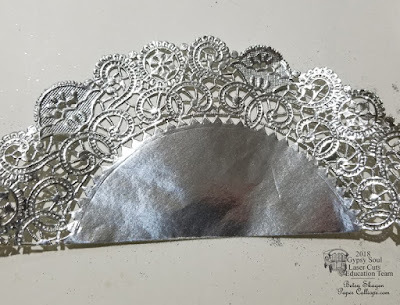 Add metal embellishments to the bottom half, as shown. Hang more metal pieces from the center hole at the bottom. After I put it all together, I realized that the red in the hearts was the only red on the piece, so I just added little splotches of Transparent Red Iron Oxide to the corrugated piece on the bottom section to bring it all together. Here are a few closeups of the two sections. 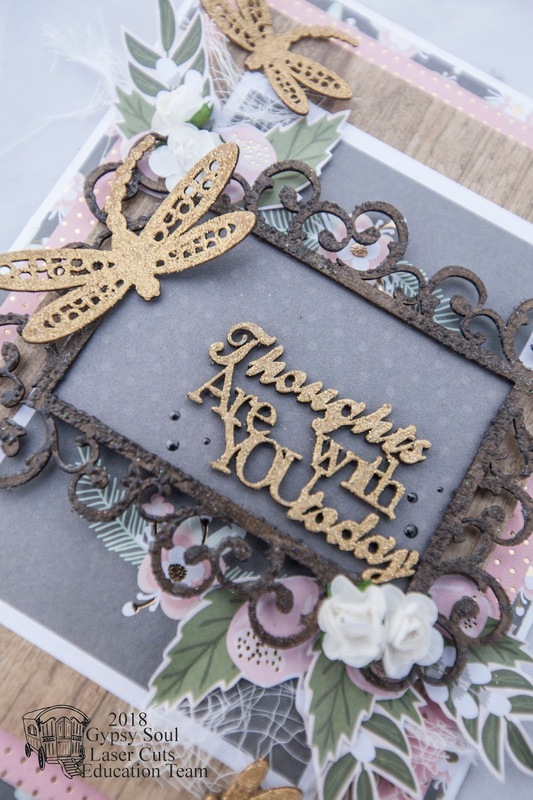 I hope you enjoyed today's project, and I encourage you to stop by the Gypsy Soul Laser Cuts shop to see all of the fabulous laser cut chipboard available. 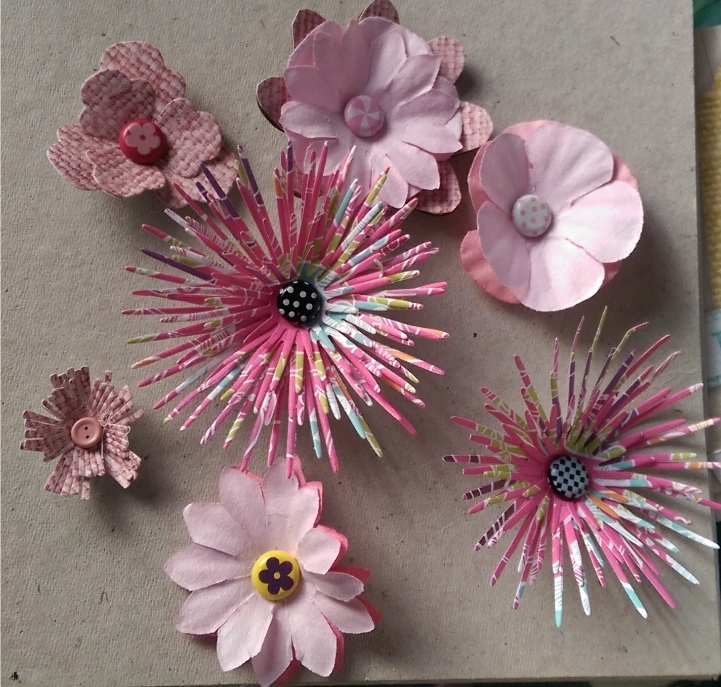 Thanks for stopping by, and have a super creative day!